Beautiful scenery , only a Ten minute walk from town and friendly staff ... oh yeah and pool! Great food, curries are the best me and the wife have had in Pushkar. Very helpful staff, rooms are exceptionally clean, literally can't complain about anything. The gardens are lush and green. Great to walk bare footed day or night. The pool is well maintained and perfect for a hot day. Could not recommend this place enough. it was good experience with country side resort, according to the name country side its resort feel at country side but its very close to local pushkar market and near to pushkar lake, they have lush green garden with many kinds of tree i have seen first time in my life that kind of beautiful tree, room we stay in deluxe room, this category room was neat and clean good quality of mattress and linen and very hygienic breakfast they serve in the morning overall it was good experience. 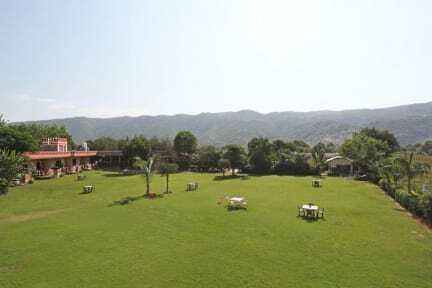 The awesome place near to Holi pushkar lake with swimming pool lush green garden and staff is very supportive friendly and helpful we enjoy lots at swimming pool side area' room are very clean with attached washroom and enough toiletries overall my stay is very nice I can suggest this place to other traveller. thanks country Side resort team and hostel world team. Upon entering my room the sheets were dirty (full of other guests hair). Had a tasty lunch and got food poisoning one hour later. The rooms are ice cold and they provided me with a tiny heater I could barely warm my feet. The hot water lasts literally seconds then you have to wait another 10 min. to finish your shower. 20 min. walking in a pitch black road to get back from the market. On the plus side, the stuff is friendly and the view is good. I was backpacking - staying in hostels - & booked The Country Side Resort as a treat. I was so disappointed! My room was filthy - the floor was covered in hair, dirt and grass. There were cracks up - and smears up- the walls, missing lighting fittings and the bed was stained with hairs on. I asked at reception for the floor to be swept twice, on the second time it was...but nothing else was cleaned. The pool was freezing with broken loungers & bottles of water had been filled from the tap.Avoid!